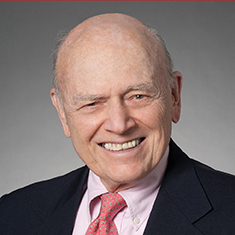 Mal Barasch was a member of the firm of Rosenman & Colin LLP from February 1968 through January 2000. He founded the firm’s Trusts and Estates department and served as its Chairman until 1995. Mal concentrates his practice in estates and trusts law, and has written on estate tax issues. He has practiced for more than fifty years, handling a broad range of matters including estate and tax planning, the administration of estates and trusts, will contests and other contested Surrogate’s Court and tax proceedings. Mal served with the US Army from 1954 to 1956. Shown below is a selection of Mal’s engagements.